Art Cars a part of the life of abstract, avant guard, contemporary artist F.Caterina Lionti. 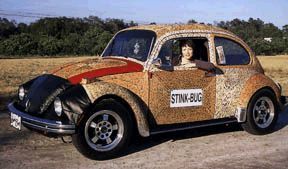 An art car is a vehicle that has its appearance modified as an act of personal artistic expression. 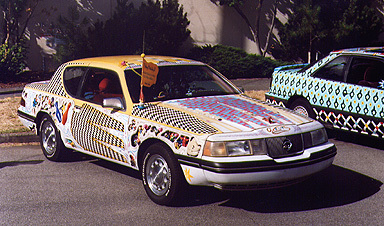 Art car artists usually drive and own their own work. They are sometimes referred to as "Cartists". Art car artists or owners often dress in a matching motif when displaying their cars. Art cars and car artists come from all walks of life, uphold a wide range of personal philosophies and beliefs and come from all political groups. Some of my best friends are art car artists. Unfortunately, my art car died during Tropical Storm Fay when a tree fell on it. 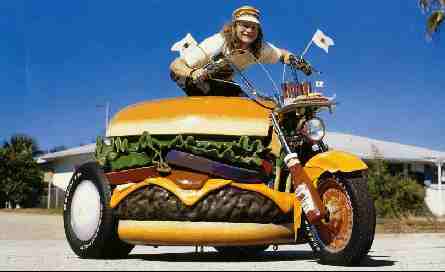 However, I am designing a new art car that will be my daily driver. It should be ready for the art car circuit by Spring 2010. Wheels of Imagination is Becky's second art car. Her first creation was called My Life a wild-colored patchwork quilt Mustang. Becky's artistic talents range from beautifully crafted fabric creations, wild art cars, and things like hand-painted artcar license plates and beaded jewelry. If you would like one of Becky's hand-painted artcar license plates, you can contact Fay Lionti through the gallery. Fay will also help you to get in contact with any of the art car artists if you would like to invite them to your next event. All images are copyrighted. Please do not borrow any images. Thank you.